South Beach pool parties at elite hotels can compete with even the best of Miami nightclubs. Miami Pool Parties start during the day and continue deep into the night. At some of the biggest hotels, deluxe pool decks are designed with tropical scenery, special cabanas and food & drink service during the whole day. Narrowing down the list of spectacular pool parties to visit, Driven Miami team has selected a few places that have proven the most popular with our regular clientele and seem to be the most enjoyable of all. 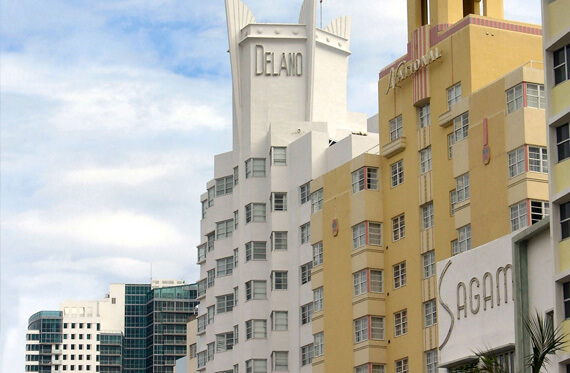 The Delano Hotel pool and beach club is one of the coolest and most popular Miami Pool Parties with a reputation as the ideal adult recreation place. The pool is 7,000-square-feet surrounded by wooden luxury chairs, freestanding white umbrellas and canopied beds which means it has enough size to host huge number of thrilled sun fans who are looking for some entertainment. Few steps from the pool is Delano’s indoor-outdoor restaurant Bianca where Chef Briant Massie prepares tasty meals. This type of outing agrees best with Driven Miami’s By the Hour service, unless you want to go splashy with a customized Miami Pool Parties Service. Fontainebleau has a long and vivid history, and it’s worth visiting even if you don’t intend to tan by the pool. 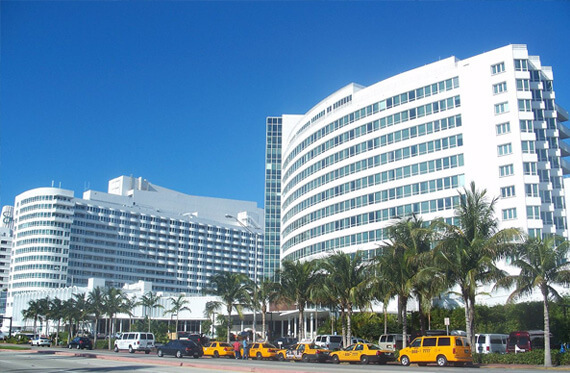 It was renovated in 2008 and is well known by its Bleau Bar, which features a panoramic view of the pools by day. Driven Miami clients like to come here in the late AM hours and chill for a while before they go on with their day. There are a few pools, 3 bars, and several seating types making this spot an absolutely glamourous one. The fact there are veiled cabanas, flat screen TV’s, WIFI, fridges, and sound systems doesn’t hurt it either. True celebrities like Jennifer Lopez and Gwyneth Paltrow have dropped by to party here… so, why wouldn’t you, too? 1 Hotel has one of the best rooftop views in all of Miami Beach. At sky level, eighteen floors above the beach, the rooftop pool is an ideal adult retreat with an amazing view of the beach. With a pool, a bar, a DJ and adults-only vibe it’s hard to leave this paradise. Still, when you do decide it’s time you go home or go to another party, your Driven Miami private chauffeur will make sure you are picked up at the agreed time and stylishly driven to another location. Your reservations are easy to book, almost as easy as getting into a stylish vehicle on a hot, party night. Enjoy your 1 Hotel extravaganza and a matching Driven Miami limo service, too. The Raleigh Hotel Art Deco pool deck was named as one of the 12 Over the top pools by Forbs. The two-level pool with a retro diving board has made Raleigh the top of Chanel fashion shows and magazine covers. Apart from the pool there is also a spectacular VIP oasis, a number of luxury cabanas, and such a gorgeous set of beachfront beds that you’ll be blown away. People who visit this place are free spirited, charming and happy individuals whose company you’ll absolute adore. Driven Miami will be taking you to Raleigh Hotel in style and picking you up at the agreed location. Gives us a ring, choose your favorite car from our fleet and let the enjoyment begin!